It turns out that there is, in the form of a December 2007 West Point study examining the background of foreign guerrilla fighters — jihadis or mujahedin, including suicide bombers — crossing the Syrian border into Iraq during the 2006-2007 timeframe, under the auspices of the international terrorist organization Al Qaeda. This study is based on a mass of about 600 Al Qaeda personnel files which were captured by US forces in the fall of 2007, and analyzed at West Point using a methodology which we will discuss after having presented the main findings. The resulting study1 permits us to make important findings about the mentality and belief structures of the northeastern Libyan population that is furnishing the basis for the rebellion, permitting important conclusions about the political nature of the anti-Qaddafi revolt in these areas. The December 2007 West Point study concludes by formulating some policy options for the United States government. One approach, the authors suggest, would be for the United States to cooperate with existing Arab governments against the terrorists. 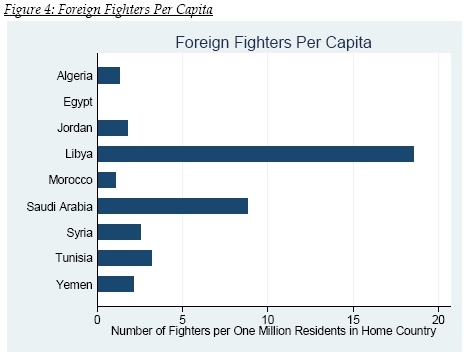 As Felter and Fishman write, “The Syrian and Libyan governments share the United States’ concerns about violent salafi-jihadi ideology and the violence perpetrated by its adherents. These governments, like others in the Middle East, fear violence inside their borders and would much rather radical elements go to Iraq rather than cause unrest at home. U.S. and Coalition efforts to stem the flow of fighters into Iraq will be enhanced if they address the entire logistical chain that supports the movement of these individuals—beginning in their home countries — rather than just their Syrian entry points. The U.S. may be able to increase cooperation from governments to stem the flow of fighters into Iraq by addressing their concerns about domestic jihadi violence.”12 Given the course of subsequent events, we are on firm ground in concluding that this option was not the one selected, neither in the closing years of the Bush administration nor during the first half of the Obama administration. The West Point study also offers another, more sinister perspective. Felter and Fishman hint that it might be possible to use the former LIFG components of Al Qaeda against the government of Colonel Qaddafi in Libya, in essence creating a de facto alliance between the United States and a segment of the terrorist organization. The West Point report notes: “The Libyan Islamic Fighting Group’s unification with al-Qa’ida and its apparent decision to prioritize providing logistical support to the Islamic State of Iraq is likely controversial within the organization. It is likely that some LIFG factions still want to prioritize the fight against the Libyan regime, rather than the fight in Iraq. It may be possible to exacerbate schisms within LIFG, and between LIFG’s leaders and al-Qa’ida’s traditional Egyptian and Saudi power-base.”13 This suggests the US policy we see today, that of allying with the obscurantist and reactionary al Qaeda fanatics in Libya against the Nasserist modernizer Qaddafi. Today, it is clear that the United States is providing modern weapons for the Libyan rebels through Saudi Arabia and across the Egyptian border with the active assistance of the Egyptian army and of the newly installed pro-US Egyptian military junta.14 This is a direct violation of UN Security Council resolution 1973, which calls for a complete arms embargo on Libya. The assumption is that these weapons will be used against Gaddafi in the coming weeks. But, given the violently anti-American nature of the population of northeast Libya that is now being armed, there is no certainty that these weapons will not be soon turned against those who have provided them. A broader problem is represented by the conduct of the future Libyan government dominated by the current rebel council with its large current majority of northeastern Islamists, or of a similar government of a future Cyrenaica rump state. To the extent that such regimes will have access to oil revenues, obvious problems of international security are posed. Gamage wonders: “If the rebellion succeeds in toppling the Qaddafi regime it will have direct access to the tens of billions of dollars that Qaddafi is believed to have squirreled away in overseas accounts during his four-decade rule.”15 Given the northeast Libyan mentality, we can imagine what such revenues might be used for. What should concern us most is that both Jalil and Younis come from the Haribi tribe, the dominant one in northeast Libya, and the one that overlaps with al Qaeda. According to Stratfor, the “…Harabi tribe is a historically powerful umbrella tribe in eastern Libya that saw their influence wane under Col. Gadhafi. The Libyan leader confiscated swaths of tribal members’ land and redistributed it to weaker and more loyal tribes…. Many of the leaders now emerging in eastern Libya hail from the Harabi tribe, including the head of the provisional government set up in Benghazi, Abdel Mustafa Jalil, and Abdel Fatah Younis, who assumed a key leadership role over the defected military ranks early in the uprising.”19 This is like a presidential ticket where both candidates are from the same state, except that Libya’s ferocious tribal rivalries make the problem infinitely worse. This picture of a narrow, sectarian tribal and regional base does not improve when we look at the rebel council as a whole. According to one recent version, the rebel council is “chaired by the well-spoken former justice minister for Libya, Mustafa Abdul Jalil, [and] consists of 31 members, ostensibly representatives from across Libya, of whom many cannot be named for “security reasons”…. “The key players on the council, at least those who we know about, all hail from the north-eastern Harabi confederation of tribes. 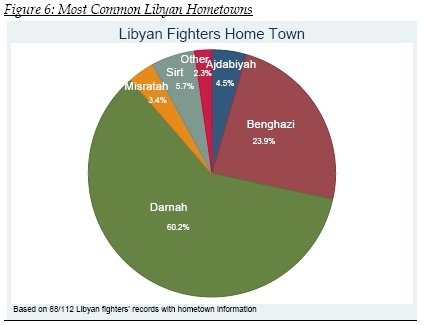 These tribes have strong affiliations with Benghazi that date back to before the 1969 revolution which brought Gaddafi to power.”20 Other accounts agree about the number of representatives: “The council has 31 members; the identities of several members has not been made public to protect their own safety.”21 Given what we know about the extraordinary density of LIFG and all Qaeda fanatics in northeast Libya, we are authorized to wonder as to whether so many members of the council are being kept secret in order to protect them from Qaddafi, or whether the goal is to prevent them from being recognized in the west as al Qaeda terrorists or sympathizers. The latter seems to be a more accurate summary of the real state of affairs. We are thus witnessing an attempt by the Harabi tribe to seize dominance over the 140 tribes of Libya. The Harabi are already practically hegemonic among the tribes of Cyrenaica. At the center of the Harabi Confederation is the Obeidat tribe, which is divided into 15 sub-tribes.23 All of this might be of purely academic ethnographic interest, were it not for the fact of the striking overlap between the Harabi tribe and the LIFG and al Qaeda. Here is the Stratfor view of King Idris and the Senussi: “King Idris came from a line of rulers of the Sanussi order, a Sufi religious order founded in 1842 in Al Bayda, that practices a conservative and austere form of Islam. The Sanussiyah represented a political force in Cyrenaica that preceded the creation of the modern state of Libya, and whose reverberations continue to be felt to this day. It is no coincidence that this region is the home of Libyan jihadism, with groups like the Libyan Islamic Fighting Group (LIFG). The Gadhafi family has thus been calling the current uprising an elaborate Islamist plot….”24 Under the monarchy, Libya was by some estimates absolutely the poorest country in the world. Today, Libya ranks 53 on the UN Human Development Index and qualifies as the most developed country in Africa, ahead of Russia, Brazil, Ukraine, and Venezuela. Qaddafi’s stewardship has objective merits which cannot be seriously denied. Against the obscurantism of the Senussi, Qaddafi has advanced the Moslem equivalent of the priesthood of all believers, arguing that no caliphate is necessary in order to discover the meaning of the Koran. He has supplemented this with a pan African perspective. Gerald A. Perreira of the Black Agenda Report writes the following about the theological division between Gaddafi and the neo-Senussi of northeast Libya, as well as other obscuranitsts: “Al Qaeda is in the Sahara on his borders and the International Union of Muslim Scholars is calling for [Qaddafi] to be tried in a court…. [Qaddafi] has questioned the Islam of the Muslim Brotherhood and Al Qaeda from a Quranic/theological perspective and is one of the few political leaders equipped to do so…. Benghazi has always been at the heart of counter-revolution in Libya, fostering reactionary Islamic movements such as the Wahhabis and Salafists. It is these people who founded the Libyan Islamic Fighting Group based in Benghazi which allies itself with Al Qaeda and who have, over the years, been responsible for the assassination of leading members of the Libyan revolutionary committees.”25 And what would be for example the status of women under the neo-Senussi of the Benghazi rebel council? But such a reversal of field cannot be improvised overnight; it took several years of preparation. On July 10, 2009, The London Daily Telegraph reported that the Libyan Islamic Fighting Group had split with Al Qaeda. This was when the United States had decided to de-emphasize the Iraq war, and also to prepare to use the Sunni Moslem Brotherhood and its Sunni Al Qaeda offshoot for the destabilization of the leading Arab states preparatory to turning them against Shiite Iran. Paul Cruikshank wrote at that time in the New York Daily News about one top LIFG honcho who wanted to dial back the relation to al Qaeda and the infamous Osama Bin Laden; this was “Noman Benotman, a former leader of the Libyan Islamic Fighting Group. While mainstream Muslim leaders have long criticized Al Qaeda, these critics have the jihadist credentials to make their criticisms bite.”27 But by this time some LIFG bosses had moved up into al Qaeda: the London Daily Telegraph reported that senior Al Qaeda members Abu Yahya al-Libi and Abu Laith al-Libi were LIFG members. Around this time, Qaddafi released some LIFG fighters in an ill-advsided humanitarian gesture. In fact, terrorist fighters from northeast Libya may be killing US and NATO troops in Afghanistan right now, even as the US and NATO protect their home base from the Qaddafi government. According to this account, a top Al Qaeda commander in northwest Pakistan was killed by US action as recently as October 2010: “A senior al Qaeda leader who serves as al Qaeda’s ambassador to Iran, and is wanted by the US, is reported to have been killed in a Predator air strike in Pakistan’s Taliban-controlled tribal agency of North Waziristan two days ago…. [This was] Atiyah Abd al Rahman, a Libyan national who has been based in Iran and served as Osama bin Laden’s ambassador to the mullahs. Unconfirmed press reports indicate that Rahman was killed in an airstrike….”28 The US State Department’s Rewards for Justice page for Atiyah Abd al Rahman notes that he was al Qaeda’s “emissary in Iran as appointed by Osama bin Ladin.” Atiyah “recruited and facilitated talks with other Islamic groups to operate under” al Qaeda and was “also a member of the Libyan Islamic Fighting Group and Ansar al Sunna.”29 Rahman was ranked high enough in al Qaeda to be able to give orders to Abu Musab al-Zarqawi, the head of al Qeada in Iraq, in 2005. In 1995, David Shayler, an official of the British counterintelligence organization MI-5, became aware that his counterpart at the British foreign espionage organization MI-6 had paid the sum of £100,000 to an Al Qaeda affiliate in exchange for the attempt to assassinate Qaddafi. The assassination attempt did occur, and killed several innocent bystanders, but failed to eliminate the Libyan ruler. As Shayler understood the MI-6 scenario, it included the liquidation of Gaddafi, followed by the descent of Libya into chaos and tribal warfare, with a possible option for a direct seizure of power by al Qaeda itself. This situation would then provide a pretext for Britain, probably but not necessarily acting together with the United States or other countries, to invade Libya and seize control of the oil fields, probably establishing a permanent protectorate over the oil regions, the pipelines, and the coast.31 This remains the goal today. 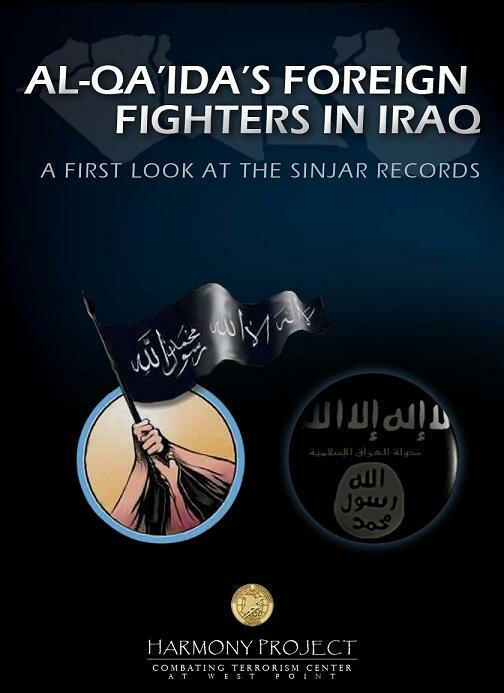 1 Joseph Felter and Brian Fishman, “Al Qa’ida’s Foreign Fighter in Iraq: A First Look at the Sinjar Records,” (West Point, NY: Harmony Project, Combating Terrorism Center, Department of Social Sciences, US Military Academy, December 2007). Cited as West Point Study. 2 Joseph Felter and Brian Fishman, “Al Qa’ida’s Foreign Fighter in Iraq: A First Look at the Sinjar Records,” (West Point, NY: Harmony Project, Combating Terrorism Center, Department of Social Sciences, US Military Academy, December 2007). Cited as West Point Study. 3 West Point Study, pp. 8-9. 5 West Point Study, p. 12. 6 West Point Study, p. 19. 7 West Point Study, p. 27. 8 West Point Study, p. 9. 10 West Point Study, p. 12. 11 West Point Study, p. 27. 12 West Point Study, p. 29. 13 West Point Study, p. 28. 32 Lucan, Pharsalia, Book IX, trans Riley (London: Bell, 1903), p. 355.